Savvy Southern Style : It's Giveaway Time!! I was just thinking the other day that it is about time to have a giveaway. Right after thinking about it I received an email from a Apol in France who has an etsy shop and she asked if I would be interested in having a giveaway. Talk about perfect timing. She carries the most wonderful vintage French items. Just look at this beautiful vintage French sheet music. Well, she is giving five sheets to TWO WINNERS. That's right. Two of you will have some of this to enjoy. She also has a blog called LaPommeHome.com. where she shares some of her items in the shop. And she shares things like a trip to the market. I wish we had markets here like they do in France. Take a minute to go check out her blog, too. 1. You must be a follower of my blog through google friend connect on my side bar where it says Join This Site. Tell me in a comment that you are one. 2. Go over to the etsy shop here and look around and come back and tell me what caught your eye. 3. Spread the word on your blog or facebook or twitter and come back and tell me in a comment. If you don't have a blog I will need an email address to contact you if you win. This giveaway will run through next Friday 7-22. THIS GIVEAWAY HAS NOW ENDED!! Thank you to all my readers and followers. This blog would not be what it is without you! Yes, I am definitely a follower of your blog. Great giveaway! I'm a follower of your blog :) excited about this awesome giveaway! I like the Zinc Pail. I loved the book of songs for children. This is a fabulous giveaway. thank you! I am a follower! Thank you for this awesome giveaway! I love the reclaimed table linens and the vintage bottles. Such a great shop! I love the vintage saumoniere that she has on Etsy. Great store! Will save it to my favorites on there. You know.... I am your follower and one of your biggest fans too. She has such lovely things in her shop and I'd love to be entered in your giveaway. Well, I was already following you through the follow button on blogger but I signed up under Google friend connect also just now. I went to the etsy site and love the French, white, egg basket. I spread the word about your give away on twitter under @ThreeBeesTea which is my twitter user name. I'm a follower and I already had favorited her etsy shop! Love her goodies-both the linens and enamelware! There are lots of things I like. I esp. like the little candle holder. I follow you! Get upset if I miss a post. What a wonderful place to shop. I am a follower and always enjoy your posts. Just got back from the etsy shop! all I can say is WOW I love the vintage metal heater and the pewter pitcher and the metal bottle crate...I could go on and on.. Thanks for the opportunity! Thank you for hosting this, Kim. Have a great weekend! How fun! Would love to be considered. I am a follower! I like the vintage wood basket! Ooh la la! I am indeed a follower.THanks for sharing. It's posted on my sidebar! Oh I fell in love with the blue french enamel pails. I am one of your followers. Nice giveaway. I love the vintage coffee roaster! I am a follower of your blog - love this give-away! I love the wire bottle basket and the sheet music, of course! I am a follower of your blog. This is a wonderful giveaway! I visited the Etsy shop and I love the cream and red linens! Visited her Etsy shop and love the vintage plumber's zinc tool case! I am adding your giveaway to my sidebar. I'm an extremely excited follower! I'd love to win. Thanks! I love the vintage green bottle. I'm a follower. I love that French sheet music. Thanks for the chance to win. I'm a GFC follower! Fun giveaway! I have been a follower for like ever! What a wonderful give away! Thanx ladies! Great giveaway...I am a follower! I love some of the great old horns in her shop! I have put this on my sidebar, too! OMYGOSH...I am having a hissy fit for this giveaway. Thanks so much for giving us a chance to win such a lovely prize. Thanks for a chance to win! I'm a happy follower! So many lovelies at her etsy shop. I'd have to say the wooden and metal items caught my eye the most. I'm a happy stalker!! lol! Hi Kim I am a faithful Follower!! Great giveaway! Oh I adore the vintage embroidered napkins! The green bottles above are perfect as well. I am a happy follower and I love her vintage sheet music and the French baby's cup. I love LaPomme! I used some of the French Music cards in a tablescape for Valentines Day. It's one of my favorite shops! 1. I'm a follower of your blog. Kim, what a great giveaway! Thank you for the chance - I follow your wonderful blog!!! I love the French Country blue seltzer bottle - so much charm and color is gorgeous! Wow! She has so many pretty things. I love all of the bottles and buckets and really like the framed mushrooms. Thanks for the giveaway! I am a follower of your blog and adore it. I'd love the sheet music from her shop - also saw some adorable wooden trays. Thanks for your hard work on daily postings. Please know it's appreciated! I am a follower. Love the French Music. OH my Gosh, there are way too many things I love in her etsy shop. I do love everything, but the fairy tale book and the baby pram were my favorites. I'm a follower and this music would look great next to my piano. I'm already one of your followers!! Love it! I love her Blue Enamel Pail!!! I loved lots of things, but that was one of my favorites. I love the color!!! I just posted about it on Facebook!! Yes, I am a follower. Yours was one of the first blogs I started following. I am a follower - love the music sheets. Happy to follow you on GFC (Wanda). Yes, I am a follower. I love the French fairy tale book. I am follower!! Thank you for the opportunity for the awesome music sheets. I checked out the etsy shop and i LOVED the french horn!! I'm headed over to etsy! Okay Kim, you and Rusty have been posted on my blog. :-) Thank you for the giveaway. I am a follower - love your blog! Well, I like almost everything. In the process of redoing our decor to French Country starting with my kitchen and bedroom and this shop will be the perfect resource! Love that vintage French sheet music... I'd be thrilled to win. I checked the Etsy shop...my oh my...lots of goodies..love the encyclopedia pages, vintage french country steel treasure chest and the handmade baskets. I love the old bottles, the pails, just about everything!! I posted your giveaway on my side bar. Have a great Sunday! I'm a follower and would love to be entered! Thanks! I just found your blog...love it! I am definitely now a follower"
I'm a long time follower and I'd love to win! I looked at the etsy shop and love the sheet music, and napkins, the wood box, the metal bottle carrier...so many things! I am a follower! This is wonderful! Definitely love music and all things French! Love the French baby cup! hopefully I have now Google friended you correctly for this wonderful giveaway! I'm a follower! Everything she has is wonderful...I especially like the linens with red & cream and the hot chocolate pot. Love following your blog and keeping up with all your decorating and paint projects! That is a wonderful giveaway !! I am certainly a follower! Such fun things in her shop. I love the vintage country blue pail. Did you see those inspiration apples?? So clever. This is the best giveaway ever! I am an elementary French teacher, so I LOVE this stuff! I love the coffee grinder as I am a coffee addict! I'm a follower and this is such a neat giveaway!!! Added the giveaway to my sidebar Kim! Beautiful Things! I think I like anything on Etsy shop. The wooden basket, the seltzer bottles, the bottle crate....I could keep going on and on. The sheet music is...well, I would love that too! Great giveaway! And, yes, I am a follower! Oh My Goodness ... I LOVE LOVE LOVE the French country handmade wood basket. I would absolutely LOVE to have that on my kitchen counter. What an amazing piece. Oh! What a lovely giveaway! oh.. I love the French Country blue seltzer bottle..
already a follower.. Neat giveaway.. Thanks!! already love and follow this blog! awesome giveaway, thank you! i saw several things i loved in her shop, but the vintage plumbers zinc tool case won me over. Wow!! What a great giveaway! I have been a follower of yours for some time. I'd love to win! Thanks! Whoo Hoo! I love those green vintage Lemonade bottles! That's what I would love most out of her wonderful shop! I'm a follower! Love, love the sheet music. Since I love classical music - would love to win the sheet music. Thanks again. I love the Vintage French country blue seltzer bottle on the Etsy website. Very nice. It's on my blog, and facebook page. Blog is http://thegatheringroomchic.blogspot.com/ Come on over and join my blogspot as well. I can't believe i almost missed this! I am working too much!!! 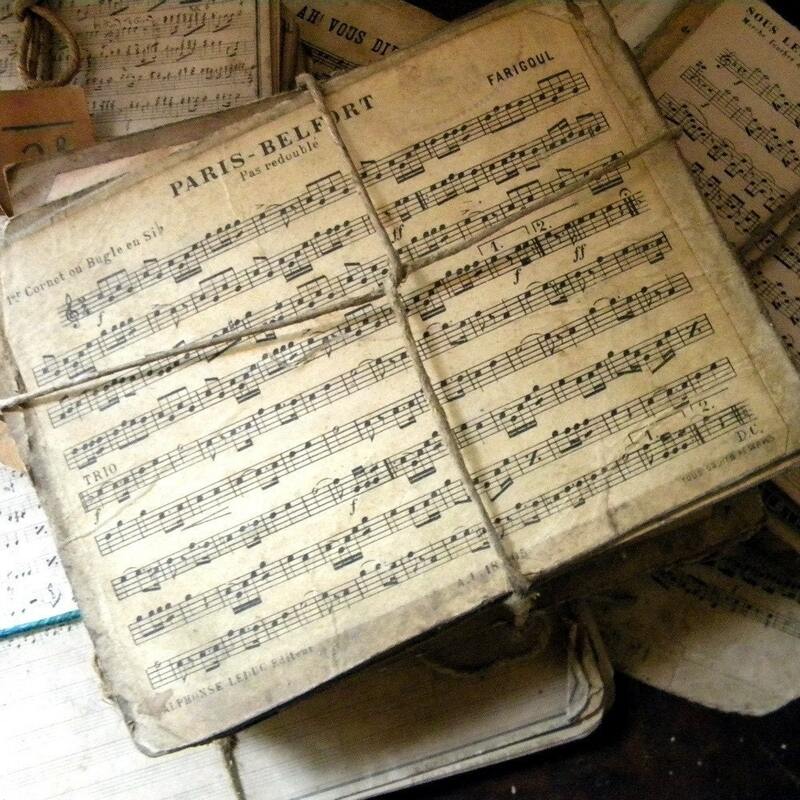 I love love the vintage French Sheet music! Yes you know I am a happy follower!! I don't miss a post being a follower! Ok I would love that sheffield silver pot that Lauren has reserved so lets see how about that antique cocoa maker, very cool site, thanks for sharing! I'm already a follower - love your blog!! Of course I am a follower! I love the zinc pail! I'm so torn between the saltbox and the metal bottle crate - such gorgeous stuff!! Thank you so much for this beautiful giveaway. Kim, I'm definitely a follower. Great giveaway. I like the wooden basket. I LOVE all things French!!! And I'm definitely a follower! I love that red enamel pitcher! I'm totally in love with the Vintage French country metal bottle crate! Oh how I love this GiveAway! I have been a follower for some time now. I love your blog! I love so many items! Here are just a few of my fav's. The red enamel pitcher and the pitcher you showed. Also loved all of the vintage bottle items. I am spreading the word on my blog and facebook. Oh my what didnt catch my eye in her shop!!! I would love to have her french bottle holder and the antique coffee grinder but would really settle for your giveaway I love vintage music and the gorgeous pillow! I added your giveaway to my blog at the bottom in my 'giveaway' section! I have to say I'd LOVED any of the print items, i.e. the music, the encylopedia pages, etc. because I JUST got two fantastic old frames with domed glass for $3.00 each at a resale shop (they're 8X10) and I was thinking how I'd love to get some vintage sheet music or vintage paper as a backing for my idea! Sure hope I win and if not, I may have to just go buy these! Thanks for the giveaway! I'm a follower, Kim ;). Oh my, what wonderful things she has in the shop! I love the French encyclopedia pages, the steel treasure box, and OMG everything! I've favorited her shop and will definitely be back there. I shared on my FB page and Twitter. I love everything in La Pomme's home section and ADORE that red pitcher so much. Thank you for the Giveaway! I am following your lovely blog. So glad I found you! One thing that caught my eye in la pomme etsy shop was the French book of fairy tales. Beautiful. Okay I think I am ligate now lol would love to be a winner!!! I've been a follower for a long time.. I am follower! Thanks for the giveaway! Okay. Guess I am a slacker....but maybe I will win. Here is my attempt. Fingers crossed. Well, better late than never! I have been "subscribed" to your blog for a looong time, but now I am a follower ;o) Yay me! I have visited her etsy store and I heart the two vintage hand woven French country bowls! I just have a thing for baskets!